The aim of the report is to improve awareness of the benefits that the arts can bring to health and wellbeing, and to stimulate progress towards making these benefits a reality in the UK. This APPG inquiry into existing engagement of the arts in health and social care was made to make recommendations to improve policy and practice. Chapters explore: a theoretical basis for the case, thinking about ‘social determinants’ underpinning current health policy and why the arts have largely been neglected in this orthodoxy; the present state of evidence on the impacts of the arts on health and wellbeing; the policy, commissioning and funding landscape as it is now; services within physical and community environments, calling for the arts to be included in health-creating strategies being developed at local and city-region level; and a review of significant research and exemplary practice through successive phases of the life course from birth to death. This material compellingly demonstrates the opportunities that exist but have yet to be seized widely. 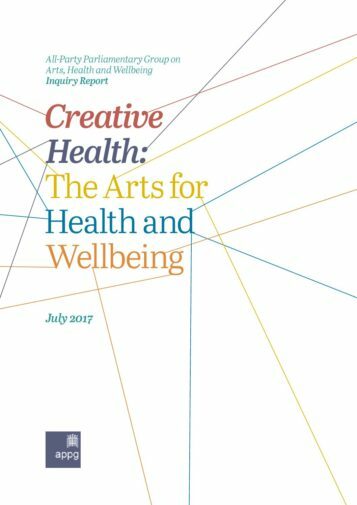 The UK is still very far from realising more than a small modicum of the potential contribution of the arts to health and wellbeing. So why, if there is so much evidence of the efficacy of the arts in health and social care, is so little appreciated and acted upon?